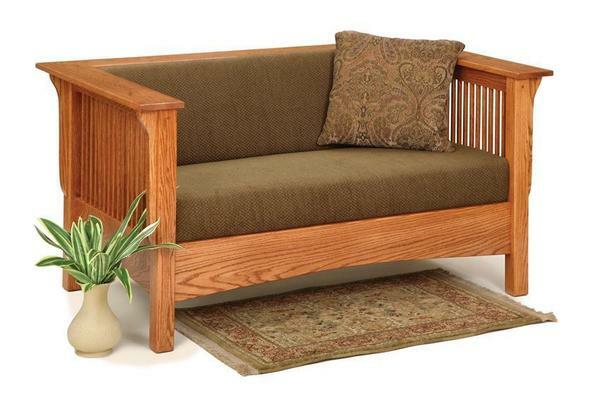 When it comes to refined Mission design, the Moon River Loveseat is one of the most stunning pieces we offer. The most striking thing about this piece is the slim, close slats that make up the fully-finished back and sides on this upholstered loveseat's solid wood frame. Every one is completely sanded and finished by hand in a small Amish woodshop in the United States, with the dedicated woodworkers who craft each Moon River bringing decades of experience and dedication to work with them every day. The results are clear to see: A stunning upholstered loveseat that has the beauty and the quality it needs to serve in the home for decades yet to come. The Moon River's beautiful back and side panels add incredible beauty to any space. Different wood and fabric choices give the Moon River a huge range of potential styles and looks. Your Moon River will be handcrafted completely to order, giving the woodworkers behind it an ideal opportunity to customize the design to meet your unique needs. Whether this means different dimensions, cushioning, or features, we would love to work with you to ensure that every single detail of your vision is brought to life. Our woodworkers love a challenge as much as we do, so if you have any custom requests at all in mind, please don't hesitate to reach out to us by phone or by email. Use the menus above to choose the perfect wood, stain, and upholstery for your Mission Morris. If you have any questions at all, or if you would like to see free samples of any of our materials, please don't hesitate to call or email us at any time. Customers have told us how much they love this wonderfully crafted sofa, and we would love to talk with you about the everyday luxury that it effortlessly brings to any space. Width Between Frame: 46 ½"
Note: Customer can provide own fabric or leather. Call for more information. 3 1/4 yards of fabric or leather is needed. Thank you for the gift of naturally made Amish soap and for all your help. The nightstands my wife and I bought from your company last year are of excellent quality and craftsmanship, and we’re looking forward to our new loveseats that are being made. We’re planning to gradually replace all our furniture with Amish mission furniture.